Reverse osmosis produces one of the purest methods of water filtration, removing up to 99% of all contaminants from water. Water passes through a series of filters including an activated carbon filter for the removal of chlorine. After which the water passes through a semi permeable membrane that has the ability to remove and reject a wide spectrum of impurities, bacteria and contaminants from the water, producing an ultra pure product water. 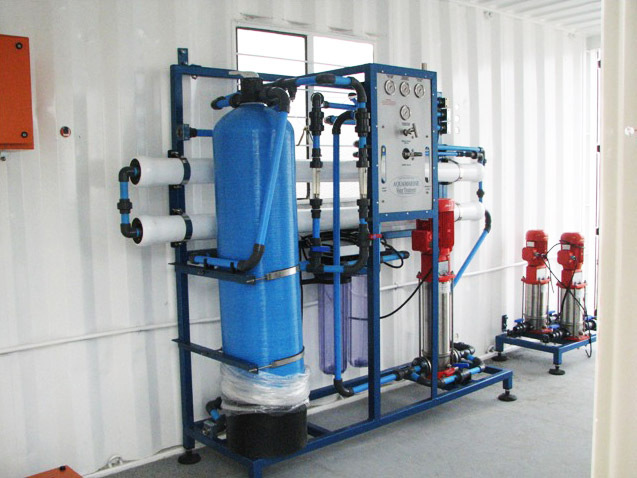 Reverse Osmosis systems were originally designed for desalination and have been widely used for many years by the shipping industry, oil rigs etc for the conversion of sea water into drinking water. Now the technology is being used by hospitals, Industry and pharmaceutical companies where the purest of water is required. R/O systems typically have the following components: A supply pump or pressurized raw water supply, prefiltration in one or more stages, chemical injection of one or more pretreatment agents may be added, a pressure pump suited to the application, sized and driven appropriately for the flow and pressure required, a membrane array including one or more membranes installed in one or more pressure tubes (also called pressure vessels, R/O pressure vessels, or similar), various gauges and flow meters, a pressure regulating valve, relief valve(s) and/or safety pressure switches, and possibly some form of post treatment. Post treatment should usually include a form of sterilization such as Chlorine, Ultra-Violet (U-V) or Ozone. Other types of post treatment may include carbon filters, pH adjustment, or mineral injection for some applications. Reverse Osmosis systems are available in different configurations to suit individual needs. Pre-filtration is of the utmost importance to prevent fouling of the membranes, different pre-filtration cartridges are available to suit local water conditions. Brackish water units are becoming more popular due to the increased use of groundwater, due to the rising expense of water & strict water restrictions. Brackish water units may be the most tricky to design as no ground water is similar in characteristics. After receiving a detailed water analyses, Blue Steel Water Treatment will design and manufacture any plant to any specification using the latest in computer assisted design software. Please click on the data sheets below for more details for some common systems. 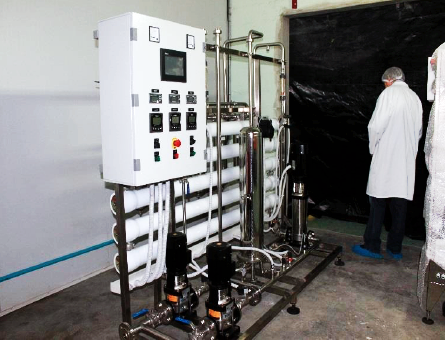 RO water treatment has become the standard at many pharmaceutical water treatment plants. RO technology can be a cost effective replacement for dual cation and anion IX units. RO systems reduce the need to use costly chemicals, especially those that are caustic, and they curtail the ever-increasing cost of regeneration waste disposal. The payback that results from using an RO system can be achieved in less than two years in some situations. An RO membrane system can remove as much as 98-99% or more of all dissolved contaminants and can remove essentially all suspended (particulate) contaminants. However, RO units require pretreatment to prevent scaling, fouling with living and nonliving particulate materials, and chemical attack, commonly by oxidizing agents. A softener is a type of IX technology that controls scaling in downstream equipment. A softener controls scaling by removing hard scale-forming cations such as calcium and magnesium and exchanging (i.e., replacing) these ions for nonscale- forming sodium ions. An older term, sodium zeolite softening, frequently is used to describe water softening. Cartridge filtration or other prefiltration technology is used ahead of RO units to protect against fouling from suspended particles in the feed water. RO membrane systems may become fouled if sufficient suspended solids (particulate) removal is not accomplished. Typically, 1-5-micron nominally rated filter cartridges are used. usually are positioned after an RO subsystem. The effluent from a mixed-bed IX unit meets USP conductivity limits for PW and WFI. UV irradiation may be used for bacterial control. EDI units in many cases can cost-effectively replace mixed-bed IX units. The resin beads in EDI units do not require chemical regeneration by acid and caustic. EDI units are continuously regenerated electrically. Reverse Osmosis has proved to be the most reliable and cost effective method of desalinating water, and hence its use has become more and more widespread. Energy consumption is usually some 70% less than for comparable evaporation technologies. Advancements have been made in membrane technology, resulting in stable, long lived membrane elements. Component parts have been improved as well, reducing maintenance and down time. Additional advancements in pretreatment have been made in recent years, further extending membrane life and improving performance. Reverse Osmosis delivers product water or permeate having essentially the same temperature as the raw water source (an increase of 1°C or 1.8° F may occur due to pumping and friction in the piping). This is more desirable than the hot water produced by evaporation technologies. R/O Systems can be designed to deliver virtually any required product water quality. For these and other reasons, R/O is usually the preferred method of desalination today. 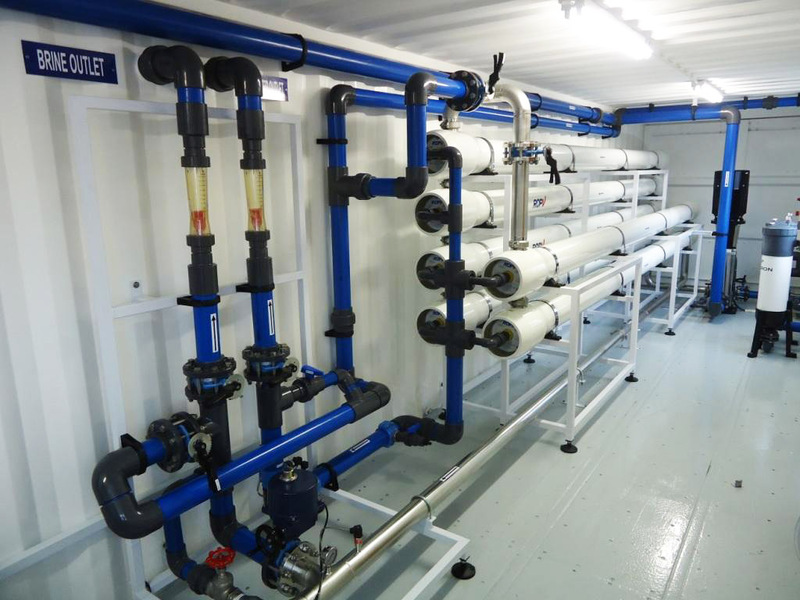 Blue Steel Water Treatment design and manufacture a full range of desalination units, and systems can be custom design to customer’s specifications. Numerous units have been built for the following industries, to name but a few. Reverse osmosis was developed as a water treatment method more than 40 years ago. The process first arose as a technique of desalinating seawater. Once the method’s decontaminating capabilities were recognized, reverse osmosis systems began to be commercially produced for the treatment of municipal water supplies for industrial use and large water bottling schemes. Such systems were installed as early as the 1970s. Reverse osmosis is a more viable option to the more costly and energy-wasteful distillation units. Systems have been successfully installed for use in the following areas where high quality process water is required. 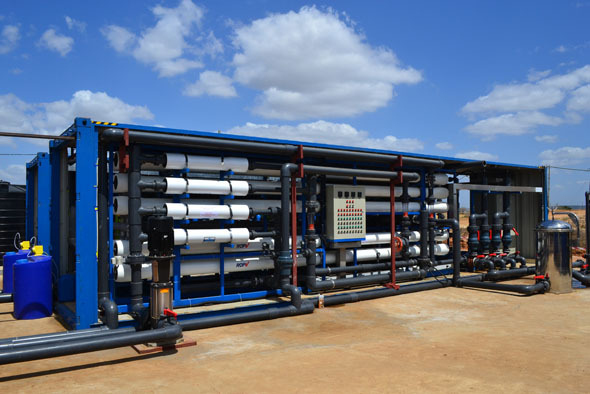 Blue Steel Water Treatment manufacture and supply a full range of Reverse Osmosis systems to meet the demands of the above mentioned markets and many systems have been successfully installed.